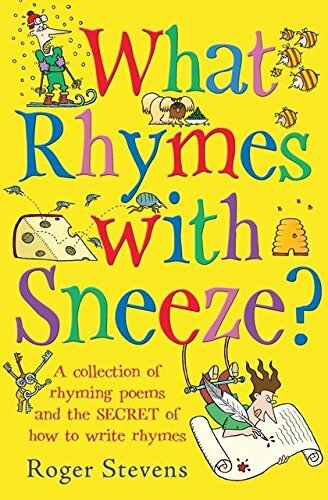 Can you think of words to rhyme with ‘sneeze’? Roger Stevens presents this challenge to his young readers and in so doing introduces them to the techniques involved in writing poetry. Starting with the most basic rhyming structures he takes them briskly through all the variations – rhyming couplets, interlaced rhymes, monorhymes among others. Then there are tricks like alliteration or assonance and different forms of poetry – the clerihew, the limerick, sonnets and haikus. All are presented in a lively and engaging fashion which makes them completely accessible – and fun. This is not least because Stevens illustrates everything, in almost every case with his own work. In this he demonstrates a great range, and while his aim is to break down barriers by raising a smile, poems such as ‘How to find our house’ and ‘Holiday treasures’ go beyond the comic without losing simplicity or appeal. After introducing the reader to the idea of poetry, Stevens closes with a section offering practical tips on writing poetry for oneself. If you are a potential poet aged 10+ – or know one – this is the ideal introduction; unpretentious, accessible and practical.